Erroneous AOA indications are causing the single-aisle jet to enter an aggressive dive. 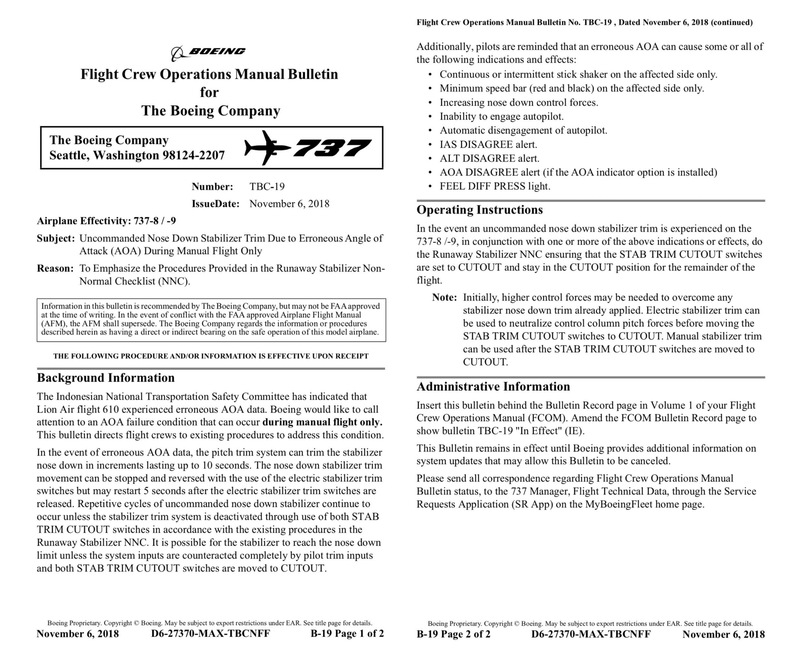 The story has been updated November 7 to reflect the issuing of the service bulletin from Boeing and Emergency Airworthiness Directive from the Federal Aviation Administration. Boeing has issued a service bulletin to 737 Max 8 and 9 operators worldwide warning operators that the jet’s angle of attack (AOA) sensor can produce erroneous indications causing the single-aisle jet to enter an aggressive dive, according to the company. The bulletin comes after a newly-delivered Lion Air 737 Max crashed off the coast of Indonesia on October 29, killing all aboard. The published bulletin specifically identified Indonesian air safety officials findings that Lion Air flight 610 experienced erroneous AOA input. The investigation into the crash is on-going, but the factual findings by Indonesian investigators and the resulting guidance from Boeing and impending regulatory directive provides a central theme as the multi-national team continues its inquiry into the brand new jet’s crash. The precise cause of the erroneous AOA data has yet to be identified, but a senior industry official familiar with the details of the investigation said a software issue is a focus of the inquiry. According to the bulletin, Boeing warns operators that the AOA issue can occur during only manual flight. The erroneous AOA input can pitch the aircraft’s stabilizer trim down for up to 10 seconds as a time. The plane maker cautions pilots to use the electric stabilizer trim to reverse the downward stabilizer trim, but the nose-over can begin again five seconds after those switches are released. The repeated uncommanded nose down action can be stopped by deactivating the stabilizer trim system, according to the bulletin. Boeing warns that the stabilizer system can reach its full downward position if not counteracted by pilot trimming the aircraft and disconnecting the stabilizer trim system. The emergency directive calls for U.S.-based 737 Max 8 and 9 operators to revise operating procedures to flight crew handling runaway horizontal stabilizer trim motion. The FAA said 246 Max aircraft are operating worldwide, 45 in U.S. with Southwest Airlines, American Airlines and United Airlines. Bloomberg News first reported the impending operator notification. Who produces the avionics for this aircraft? Being a retired Airline Employee and a Air-force mechanic. I suggest the FAA to ground all these aircraft and make sure they are fixed properly. Remember your dealing with peoples life’s. Not the way to introduce a new aircraft that has a :Life killing” fault designed into it. I would refuse to pilot this aircraft or even fly on it !